My daughters are fluent French-speaking wonders, and they’ve taught me something amazing about linguistics and communication: French speakers implement a specific salutation for different people holding different stations within society. It seems obvious, and there are some remnants of it in English, but we might have forgotten the lesson it was supposed to teach us. Consider to whom you’re speaking when crafting your message. Marketing is a relationship. At its best, marketing makes us feel special, understanding our needs and communicating based on what the marketers know of us. At its worst, it feels like a tone-deaf opera singer blasting away in our ears. Consider where the most interesting conversations are happening right now. Social media enables one-to-many and one-to-one dialogues between brands and individuals. Wearable technology is the nervous system for making marketing and experiences intelligent—it provides a deeper, more intimate view into the behaviors, needs, and wants of every wearer. Because we’re entering an age of natural language interfaces and believable human-machine interactions, we have opportunities to extend the voice and elastic nature of conversation far beyond the reach of any individual department. We have the tools to get there, and learning how to use them will be the difference between marketing that feels like it understands its audience and marketing that is full of well-designed, perfectly written messages that are never actually read. Explore ideas using a lack of time to your advantage. The goal is to generate different directions for future exploration. Guide your exercises with “how might we” questions, examining new points of view. Stanford University’s d.school sets the standard approach to open ideation. Exploration is also the space where we demystify technology to better understand where the message will be received. Experiment and make ideas real as quickly and cost-effectively as possible. Marketing-led initiatives are the beating heart of customer experiences. Coming to the table with a developed idea encourages a “show first, tell later” approach to sharing ideas, and it also helps marketers think through blind spots long before ideas are set in stone. Invision is a great tool for creating prototypes and accelerating the product and idea development process, enabling quick refinements throughout. Co-design ideas with your audience. Put the pencil in their hands, and ask them to draw the solutions. Your value is in guiding the process and asking the right questions. Put back-of-the-napkin sketches and early prototypes to good use by inviting audience participation right away. Ideas that fall flat get brushed aside, while successful ones move ahead with additional investment. At the end of a design cycle, you’re left with tangible evidence of valuable customer-validated ideas. It’s a powerful first step toward building the business case and the confidence to know you’re heading in the right direction. MU/DAI’s Los Angeles office recently completed the phase one design for Property Connect, a startup taking the complexity out of renting while optimizing property value for the multi-family rental market. 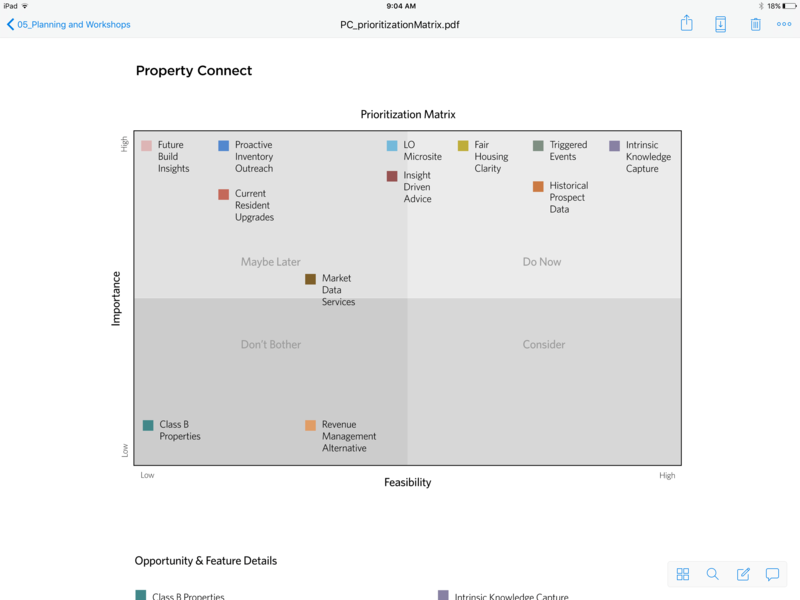 The Property Connect LiveOffer app is a revolutionary tool for renters and property managers, changing the way people negotiate rental terms. Our combined teams used a condensed timeline as a brief for focusing many ideas into sustainable ideas. This gave the combined team a method for rapid concept generation and focusing through an initial immersion workshop. Key stakeholders gathered for an all-day session where motivations and business requirements were prioritized and organized into features and functions. At the end of the day, our combined teams were left with a blueprint for creating a product, its message, and the ingredients for a lasting visual system that will evolve into a recognized brand. Our design phase is accelerated by prototyping ideas to gain a better understanding of their impact while prioritizing features in real-world conditions. Unsustainable features are removed and sustainable features promoted, bringing form to the design through practical means. There’s no guesswork—just usable products that emerge from rigorous use. Our next phase of work will expand the proof of concept into a fully realized visual system built on a tested blueprint. We’ve given ourselves the foundation to create a hardworking experience by removing risk and testing assumptions from the formation of the concept through end use—the basis for effective design that can be measured at any stage and in any medium. The rapid advancement of design tech has changed the tools we use to communicate and what defines design. Marketing isn’t just a visual—it’s the behavior before, during, and after the experience. Brands should approach their marketing plans as they would develop any other product: with an understanding of the intended outcome as the driver for the design thinking that guides the development of the campaign. 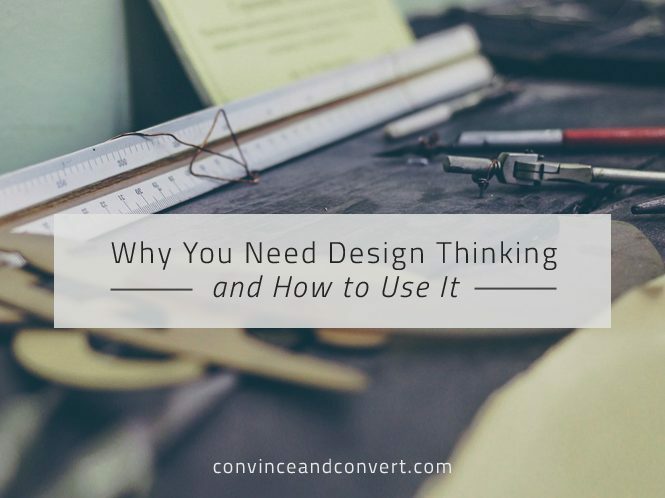 The deluge of customer profile data, devices, modes, media, and messages requires the use of a design thinking approach to effective marketing. Design thinking explores new ideas and puts structure into the development of new concepts. Shanon Marks is the chief innovation officer at MU/DAI. His work focuses on the application of emerging technology and data to augment and improve the human experience. He simplifies technology through design, leveraging the analytical power of digital to create predictive and invisible experiences. He’s constantly searching for the innovations that will fundamentally improve our lives and our planet.